Welcome to the AARP® Auto Insurance Program from The Hartford! If you’re a Nebraska driver looking for a car insurance quote, or just want to learn more about buying car insurance in Nebraska, we’re here to help. Since 1984, the AARP Auto Insurance Program from The Hartford1 has been protecting AARP members in Nebraska and their families with car insurance. Nebraska contains many historical sites and beautiful scenic routes, so there is plenty to see and do. When you travel along Nebraska’s roadways, taking adventures to landmarks like the Happy Jack Peak and Chalk Mine, or catching a show at Pinnacle Bank Arena, you can feel protected with car insurance from the AARP Auto Insurance Program from The Hartford. With high customer ratings for claim service, The Hartford has earned a reputation for integrity and trust over the years. Nebraska state law requires you to furnish a copy of your car insurance ID card if requested by a police officer or other party if involved in an accident. That’s why it’s a good idea to keep a copy of your ID card in the vehicle with your registration. 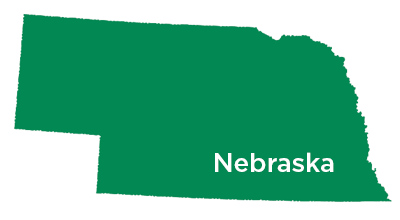 For added convenience, Nebraska is now among the states that will accept an electronic copy of your ID card. With The Hartford’s mobile app, you can store your ID card right on your mobile device. Visit the App Store™ or Google Play™ for more information. Although the state of Nebraska does not have mandatory seat belt laws, law enforcement can ticket you for this violation if you are pulled over for another reason. New drivers in Nebraska are not allowed to use hand-held or hands-free cell phones. Texting while driving is banned in the state of Nebraska. Getting a driver’s license is a rite of passage for all teenagers, and Nebraska wants to be sure they stay safe in the process! Nebraska has implemented graduated licensing laws to ensure that teenagers gain the experience and maturity that’s required to be safe behind the wheel. Graduated licensing laws limit nighttime driving, restrict teen passengers and ensure an adequate amount of supervised driving practice.